Can two voters, using nothing but their own talents, time, influence, and money, sway a presidential election? San Luis Obispo businessman Cliff Branch and Cal Poly alumnus David Riordan are determined to try. Success, they say, will mean seeing Barack Obama in the White House. 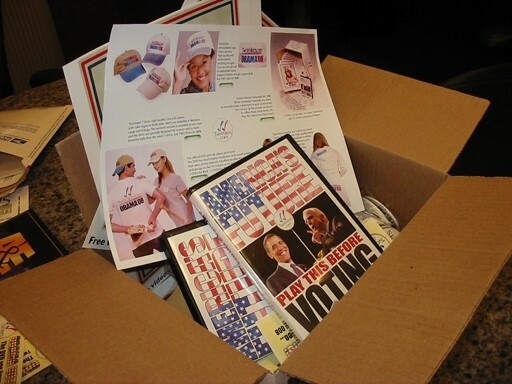 A BOX OF OBAMA : On TwoVoters.com, people can buy a box of campaign materials featuring buttons, tickets, and posters. The two longtime friends have launched a website, TwoVoters.com, which Branch is promoting through a self-funded national advertising campaign. The focus of the website is a series of short videos produced by Riordan. The TwoVoters model could be called open-source politics, along the lines of open-source software, which invites programmers to appropriate the software for their own uses. In essence, they plan to make the videos available to anybody to send to their friends, or, if they’ve got the money, pay to put them on the air as political commercials. It’s an approach that combines the small-d democratic nature of the Internet with an entrepreneurial approach to politics. Branch and Riordan say they came up with the idea—when else?—during a conversation on the Fourth of July. There is, they emphasize, no billionaire funding the effort; there are no secret ties to labor organizations, Obama, or the Democratic Party. It’s just two guys who attracted dozens of volunteers, made a bunch of web videos, and now hope that others will follow suit. Branch said he knows some of those calls are bound to be media or political operatives simply wondering who the heck they are. “I expect to get some flak from some of my Republican friends,” he said. In fact, he knows by experience. Branch is a commercial property owner who has developed and sold businesses locally, including Warehouse Sound Co., which he sold to CBS Corp., and California Cooperage, sold to Coleman Co. In 2006, fed up with the Iraq war, he spent tens of thousands of dollars to place a national ad in USA Today asking the question: “How many must die before we change course?” It was, as he describes it, essentially a letter to the editor that he decided to bring to the nation. Riordan has worked in music, documen-tary film, television, video games, and interactive entertainment. A trivia aside: He co-wrote the chart-topping hit song “Green Eyed Lady,” with the band Sugarloaf. The work saw Branch holding focus groups and Riordan filming and coordinating the short-form political spots. While some of the work was done in Colorado, where Riordan has been working on a project, most of the people featured in the spots are Central Coast locals. They include Randy Hose, a Central Coast man who describes himself as a former Airman First Class who served two Middle East tours of duty and came to question the war. Also featured is Joanna Jones, a golden-voiced Nipomo teenager who, in one spot, describes looking forward to choosing Obama when she votes for the first time. She is also featured in get-out-the-vote campaign posters the group is distributing in an “Instant Obama Campaign Kit,” available on the website. Ads promoting the site are also set to run in USA Today, Rolling Stone, the San Francisco Chronicle, and other regional publications, including New Times. Branch, the marketer of the group, said campaign materials will also be sent to about 1,500 opinion leaders, ranging from womens’ groups to investor Warren Buffet, in the hopes they’ll fund ads themselves. Branch paid for one spot, called “Maverick,” to run in the media markets in Minneapolis during the Republican National Convention. The spot highlights ties between John McCain and President Bush. That led to the organization getting mentioned in blogs and highlighted on Obama’s own campaign. Branch emphasizes that there have been no connections between TwoVoters.com and the Obama camp; by law there can’t be any “coordination” or the organization won’t be considered independent. The law is fairly clear. If Branch and Riordan stick to paying for their own ads, they don’t have to report anything or form an official committee; it’s considered freedom of speech. If they start taking donations, however, that would trigger a host of reporting requirements. Branch won’t say exactly how much he’s spending on the effort. He describes it as a lot of money for a small-town businessman, but not a lot of money in the scheme of a national political campaign. The approach falls in the early tradition of Ross Perot, who first came to political attention through a series of ads designed to get candidates talking about the national debt or, more recently, the billionaire T. Boone Pickens, who is spending tens of millions to promote wind and solar. Another obvious model is MoveOn.org, the liberal activist group that formed in response to efforts to impeach President Clinton. Branch bristles at any comparison; he said the group “lost him” in a recent campaign saying Gen. David Petraeus had “betrayed” the country in his running of the Iraq war. As for what comes next, the two voters in question say they’ll be playing that by ear for the next 60 days leading up to the election. But whatever happens, they won’t be joining forces with any national parties. Managing Editor Patrick Howe is just one writer. Reach him at phowe@newtimesslo.com.